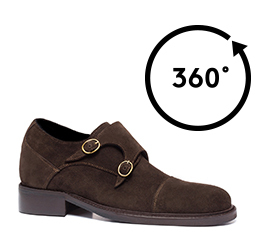 Double buckle elevator shoes with upper in dark brown calfskin suede and outsole in real leather. Clean lines and a refined design for a double buckle that radiates the secrets of a meticulous craftsmanship. A timeless model, made of fine leather and finishes made entirely by hand with a comfortable fit even by wearing the highest increasers.